There is nothing finer than the authentic flavor of a wood-fired barbecue pit grill. The unit is built with fire grates, adjustable from 4" to 15" below the cooking grate. Each end of the firebox has doors for easy clean-out and draft control. The nickel-plated grate measures 24" x 60" (10 sq. ft.) and is adjustable to four cooking heights. Firebox has a double wall. 1/10" thick (12 ga.) steel exterior cabinet with a 3/16" liner. 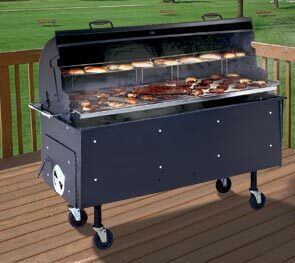 The PORTA-GRILL® Pit Barbecue has a Bread-Box Hood with thermometer included and is available on 5" casters or trailer mounted. shown with optional warming rack.